In a way, it’s like a present-day reinvention of mild jazz fusion. But then it’s many other things. 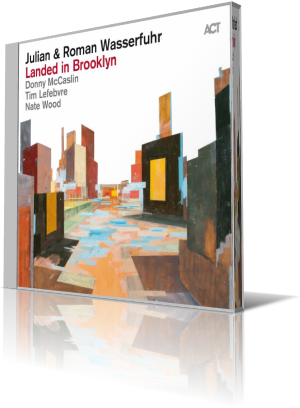 Landed in Brooklyn (ACT Music, 2017) by brothers Julian and Roman Wasserfuhr touch several bases, with regard to types of jazz. The players are Julian Wasserfuhr, trumpet and flugelhorn; Roman Wasserfuhr, piano, marimba and seaboard; Donny McCaslin, tenor saxophone; Tim Lefebvre, electric and double bass; and Nate Wood, drums. “Bernie’s Tune” is a bright, upbeat selection. Though it is its own song, it revisits the type of music that made Chuck Mangione a breakthrough crossover success in 1977. McCaslin duets with Julian, providing a counter melody to the lead. After their dynamic opening sequence, the horns step back, and the piano emerges. The mood for the entire piece, but especially the solos, is ideal for an afternoon, sightseeing drive. “Tinderly” departs from the smooth or fusion venue and embraces straight jazz. The horns harmonize for the starry melody. They break down into a cool jazz verse of alternating lines. McCaslin then takes the tenor onto an excursion of joy and wonder. Julian dials back the intensity a bit, but brings it back up as he gets deeper into his part. The brothers were 17 and 20 when they caught the attention of producer Siggi Loch. That’s when they joined the roster of ACT’s “Young German Jazz” series. They wrote all but two tracks of Landed in Brooklyn. The music comes across naturally and full of energy. The brothers brought some of the sheet music with them, but the magic comes when very little was agreed upon or set in advance when they arrived for the session. That approach gives the album more of a live, improvisational feel.